Sakac Hall officially closed Sunday evening, Sept. 23. Officials are unsure when it will reopen. All dorm residents relocated to other dorms on campus as well as hotels in Newburgh and the town of Fishkill. 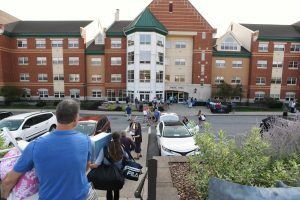 An email sent by the Mount’s marketing department explained that several student reports of mold alerted them to call in a national industrial hygiene firm and environmental consultant were called in on Sept. 21, to asses the situation. Sakac residents were sent home or relocated for the weekend for their safety. After the assessment and advice from the Orange County Department of Health the Mount decided to close Sakac Hall for cleaning, with no set deadline of completion. Where residents are relocated is reportedly based upon priority, with athletes being the first to be relocated to other dorms on campus. The residents who are housed off campus will be given transportation by the Mount through shuttles and temporary parking passes if needed. Many Sakac residents feel this priority system is unfair as it doesn’t take into account several late evening/night activities that could cause issues with transportation systems. Mount freshman Rebecca Herrera is not an athlete but has very late night activities, sometimes being busy until 11 p.m. “I would 100 percent prefer to be on campus because of my schedule and rehearsals,” she said. As for the belongings of the residents, they were told to pack the essentials and at least two weeks worth of clothes. Any belonging they could not bring were to be packed in specifically labelled boxes and left on their beds to be moved into temporary storage by the Mount. All decorations were instructed to be taken off of the walls. Professors have been instructed to adjust their syllabi accordingly to the disruption of the freshman’s schedules. Residence Life staff have also been placed among the off campus students to help them if need be, with Security & Safety also doing rounds at the locations. For more information or to ask any questions about the situation email sakacinfo@msmc.edu.